Since Dr. Tyler was raised here and is now raising his own family in the communities we serve, and because of all of the great patients we come in contact with every day, it’s vital to our office to give back in a variety of ways. Robison Orthodontics is a major participant and provider for the Smile Back Foundation. This organization teams with other professionals and doctors in the East Valley to locate underprivileged and deserving students for whom orthodontic treatment and dental care could be life changing. Dr. Tyler has provided several treatments in the past, and is excited to continue to participate in the future. Supporting Mesa Public Schools, Gilbert Public Schools, Higley Public Schools, and area charter schools is a priority for Robison Orthodontics. Many of our office contests involve raising funds for schools. We also participate in oral health education presentations at various elementary schools, and are proud to sponsor many school activities. Being an Army Reserve member himself, Dr. Tyler loves our armed service members and looks for opportunities to support them. One way we do this is with our Candy Buy Back event, which we do every Halloween. We buy back cavity-causing candy from our patients’ families and send the treats to the troops to let them know we care. We hope they brush after they eat the treats! 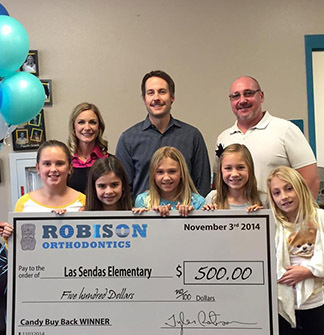 The Robison Orthodontics Candy Buy Back program is our way of promoting dental health in the local community and giving children a way to earn some easy cash, while giving back to our troops and earning money for their local schools.